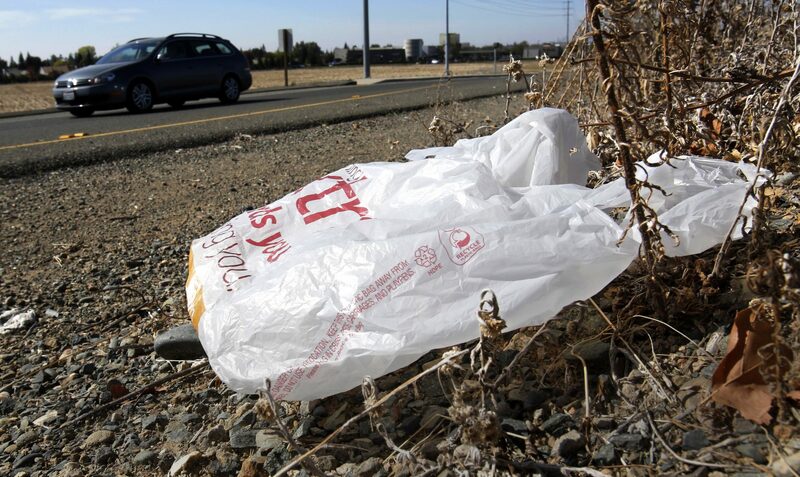 FILE PHOTO: A plastic bag sits along a roadside in Sacramento, Calif.
(Harrisburg) — Plastic straws, plastic bags, and Styrofoam food-takeout containers could be on their way out in Pennsylvania if some Democratic state lawmakers get the change they want. The group has announced a package of 13 bills that tackle environmental and health problems posed by waste, litter and single-use plastic. The bills aim to alter the behavior of what they call a “throwaway society” with bans and taxes to punish use of plastic items that can be used only once, while pushing for incentives for recycling and waste reduction. The “Zero Waste PA” legislative package is led by State Rep. Tim Briggs of Montgomery County. In February, he introduced a bill that prohibits restaurants and stores from dispensing their food in plastic plates, cups, or any other polystyrene container, including Styrofoam — and he wanted to broaden the scope to try to solve the bigger waste and litter issue. 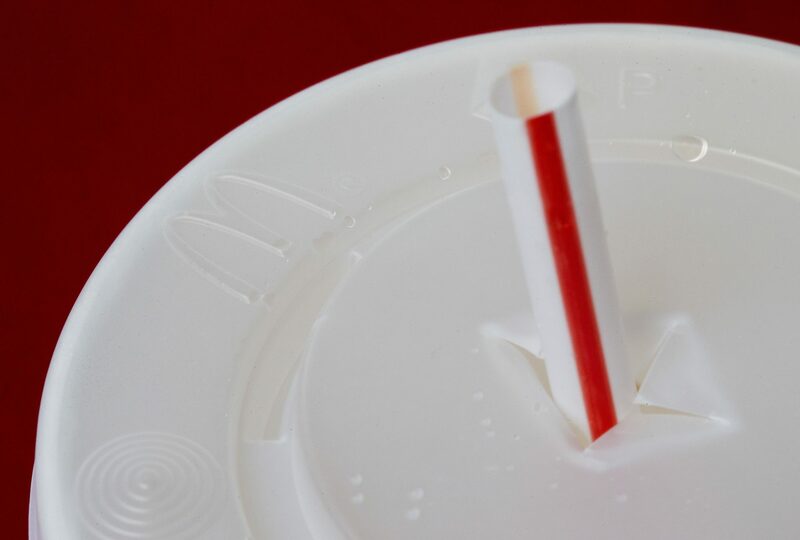 FILE PHOTO: A large soft drink with a plastic straw from a McDonald’s restaurant is shown. The package includes a bill from Montgomery County Rep. Mary Jo Daley that would prohibit plastic straws from being distributed, except at the request of a customer. Another measure, from Philadelphia Rep. Donna Bullock, would increase fines on illegal dumping. A 2-cent fee on non-reusable plastic bags at big grocery stores was presented by Philadelphia Reps. Brian Sims and Jared Solomon. A bottle bill that gives 5 cents per container returned was announced by Bucks County Rep. Wendy Ulman. Legislation that would prohibit the distribution of products with packages made with non-recyclable plastics, unless the company selling the item takes the packaging back, was proposed by Chester County Rep. Melissa Shusterman. And a measure that puts a 20-cent deposit on cigarette packs was offered by Philadelphia Rep. Chris Rabb. Bucks County Rep. Perry Warren announced a bill that would reduce the number of plastic water bottles sent to landfills by requiring newly constructed state buildings and those undergoing renovations to water and pipe infrastructure to install water-bottle filling stations. Another set of bills presented by Reps. Danielle Friel Otten, Parry Kim, Mary L. Isaacson, and Elizabeth Fiedler seeks to reduce waste by improving recycling and composting, or by increasing the disposal fees at landfills and incinerators. And a bill from Rep. Mike Zabel of Delaware County calls for implementing best practices for electronic-waste recycling. Fiedler, who represents a district in South Philadelphia, proposed increasing the disposal fee at municipal waste landfills to $8 per ton from $4, to reduce the amount of trash imported into the state from New York and New Jersey. The American Progressive Bag Alliance, representing the plastic-bag industry, has been actively lobbying in Pennsylvania and New Jersey to push back against bans and fees. Its representatives say plastic-bag taxes don’t reduce waste and litter, and instead make groceries more expensive for lower-income communities. PennEnvironment’s Masur said that even though fees may increase the cost of some items by a few cents, taxpayers also pay the cost for cleaning streets and waterways. The legislative package is the first step in a journey that could last many years, Masur said. His organization’s next steps are to work for bipartisan support of the bills in the State House, getting partner legislation in the State Senate, and having public hearings that would lead to votes on the existing bills.